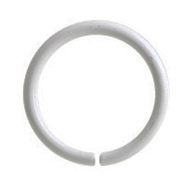 Hold the two ends of the ring firmly on either side of the gap. Twist the ends away from each other, one going towards you, one going away. When the gap is a few millimetres wide, insert the ring into your piercing. Now twist the ends back into their original position. You may need someone else to help you with hard to reach piercings. The one thing you shouldn’t do is pull the ends away from each other in the same way as a BCR – this will deform the shape of the ring and make it difficult to return to its former shape. 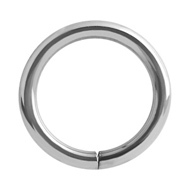 All continuous piercing rings have the same basic design – a continuous ring with a very small gap on one side. 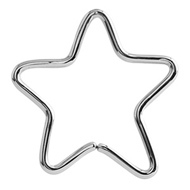 We have a great choice of rings, including the ones that you can see below. 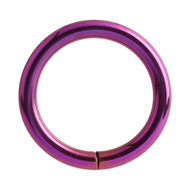 The titanium rings are also available in green and rainbow colours, while the white steel ring is available in both 1.2mm and 1.6mm, in a choice of diameters to suit your needs. This entry was posted in Ball Closure Rings and tagged Continuous Piercing Rings, Piercing Rings on February 26, 2014 by Piercing Guru.